With that in mind, with a burning desire to experience their famous pre-Halloween Tea service, I recently treated myself to an afternoon of tea-themed delights at The Parlour in Durham, NC. I’ve been to afternoon tea before so I had a rough idea of what to expect. 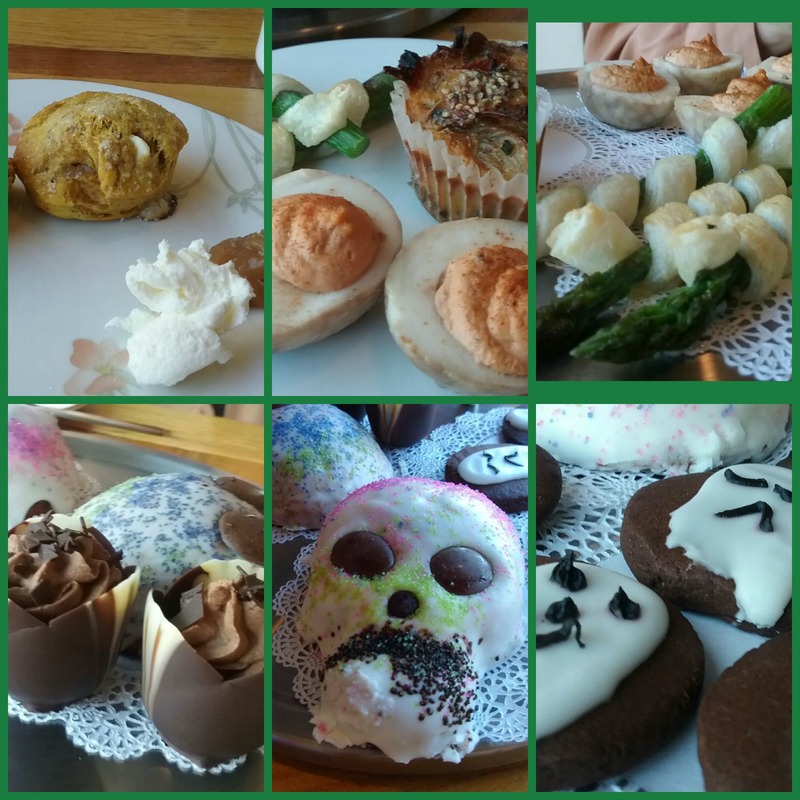 But the idea of a “spooky” and “spicy” afternoon tea had me enthralled, to say the least! Would I be sipping witch’s brew? The Parlour is really an ice cream shop. In wintertime, they bring a different type of joy to their customers by offering afternoon tea throughout the season. Just as they do with their ice cream selections, they do a spankin’ good job with the tea. For the pre-Halloween event, tea choices were Earl Grey, English Breakfast, Raspberry Green Tea, and Blueberry Rooibos Tea. All delicious. And of course, there were the goodies. Despite its name, Afternoon Tea is only half about the tea. The other half is the goodies. Remember: this tradition was created with a purpose: to fill those long hours between lunch and dinner when you crave a snack and perhaps some company as well. Long considered a showcase for pastry chefs and creators of other small bites, Afternoon Tea is known for delightful, light fare that pleases the eye and only slightly fills the stomach (wouldn’t want to spoil dinner). Grouped into savory and sweet, the treats offered by The Parlour did not disappoint either. The white chocolate was a nice touch on the pumpkin scones, especially for those of us who are not huge fans of the ubiquitous pumpkin flavor this time of year. The chocolate solves that problem, making them utterly scrumptious… and the apple butter was perfect. In case you’re wondering how all this is even remotely “spooky”, let me tell you about the velvet skull cakes! Divine is the only word that seems fitting. Oh, and there were spicy ghost cookies. As for the savory offerings: here’s where more of the spicy came in: the spicy deviled eggs infused with gochujang tea. So appropriate, so perfect, and definitely one of my favorites from the entire afternoon. And a final bonus: if you attend a wintertime afternoon tea at The Parlour, you can purchase a pint (or two) of ice cream to bring home, and their ice cream is outstanding! I brought home Toasted Coconut (vegan ice cream) and Lemon. By the time this gets posted, they’ll be long since devoured but I can assure you: every bit as wonderful as the afternoon tea delights served that day at the Pre-Halloween Tea.